Rollerblading plus gladiator combat in the future! 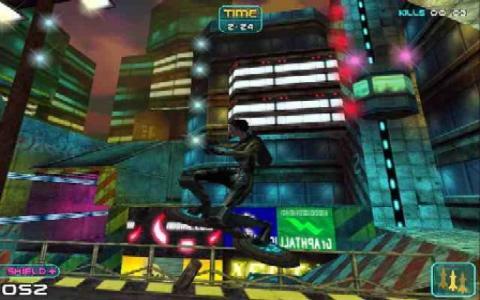 In G-Sector you get to participate in a series of futuristic sport events that combine fast roller-blading with similarly fast martial artist sports of contact. The game is delivered in real time, third person mode, with beautiful graphics, and it also has a lot of nice levels, pretty well done, most of them, set within this futuristic town setting. You can also play in first person if you'd like, but the third person perspective allows you a much better way to control your character, your moves, whether they be rollerblading or the punching and kicking of the action portion. The unfortunate thing about the game is that, while rollerblading you also have to make sure you keep your gait steady, while executing the moves you need to execute to beat the others. Thus, it can take a while to get used to the control scheme, but after you do, you'll find this combination of control elements to be really well put together, satisfying and well done. So, all in all, G-Sector is a good game, similar to Trickster though a bit more graphically satisfying than that one if you care a lot about graphics. Still, both of them are nice action/rollerblading combos worth downloading.